What is the difference between rope lights and LED strip lights? Rope Lights vs LED Strip Lights: What are the differences? The lighting market is still quite confusing from an outside (and sometimes inside) perspective. There are many different products on the market, and we often get asked the question, “What is the difference between rope lighting and LED strip lighting?”. A more playful explanation of this topic can be seen in our “Rope lighting vs. LED strip light‬‬‬” video (with a convincing “get ‘em” statement). After reading the comparisons below, you will be able to determine whether LED strip lighting or rope lighting will be best suited for your project. Rope lighting has been on the market for a long time and has a variety of uses. Basically, it is a long cylindrical tube that houses an internal light source placed every few inches that gives the appearance of a “glowing” or “twinkling” light. The tube can be plastic, epoxy, or other clear materials that allows the light to shine through. Specific uses for rope lighting are mainly decorative because the light output is minimal. Lighting Source: Rope lighting can come with Incandescent bulbs or LED bulbs. LED are more commonly used because of their flexibility of uses and longevity. They can come in either 120/220vAC input or 12/24vDC input. They come in a variety of single colors but are not RGB color changeable. Size: They typically come in ½’’ diameter or ⅜’’ diameter tubes. The mounting clips sometimes add extra width to the product. Brightness: Low brightness. Best for decorative lighting and not suitable for the majority of accent lighting projects and will not be acceptable for any task lighting or display lighting. Applications: They are suitable mainly for decorative applications or very low light level accent lighting. Due to their 360 degree viewing angles, they can be used to easily wrap around objects like trees or be bent into shapes and letters. 1. Cost: They are relatively inexpensive and can be cost effective in the short term if they are of high quality. 2. Run Length: Rope lights can be ran upwards of 250 feet when used with an AC input and around 50 feet when using DC input before requiring an additional power input. 3. 360 degree viewing angle. Enables them to be made into shapes or used better for christmas decorations. 1. Low Brightness: The main downfall of rope lighting is the low brightness levels. Rope lighting is not the correct choice for many types of applications that LED strips would excel in, such as under cabinet lighting, task lighting, high visibility applications, and many projects that need smaller working areas. 2. Yellowing of the tube: This is very common with rope lights. The epoxy or plastic tubing quickly becomes dried out and cracked in the sun. Over a short amount of time, the tube can appear yellow and sometimes brown. This will decrease the light output and change the color emitted. 3. Size: Rope lights are very thick and are difficult to install in many areas. 4. Mounting: Larger mounting clips must be used to secure the rope light to the surface. Does not have an adhesive backing like strip lights do. 5. Low bend angle: Due to the internal wiring of the rope light, bending the light too much in any direction can cause the lighting to fail. 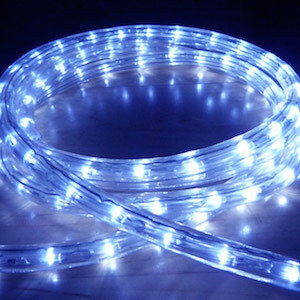 An LED Strip Light (also known as an LED tape or ribbon light) is a flexible circuit board populated by surface mounted light-emitting diodes (LEDs) that usually comes with an adhesive backing. There are many quality levels of LED strip lights so it is important that you understand the difference between high quality and low quality LED strips. 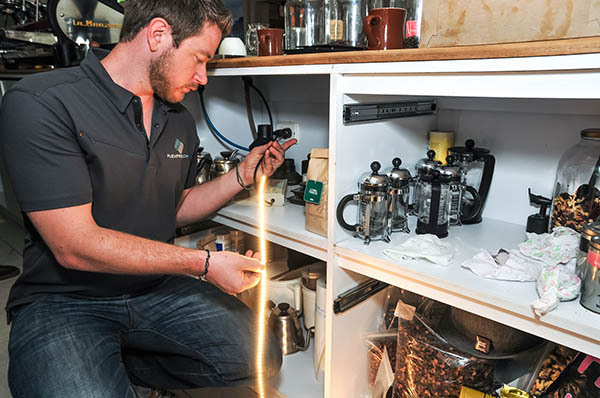 These flexible LED strips boast a flat, low profile shape which allows you to install them anywhere and cut where needed (at any cut point), making it a more adaptable lighting tool. Because of their brightness and customizability, LED strip lights are used for a variety of applications that range from kitchen under cabinet lighting to replacing ceiling fluorescents, lighting a small hobby project, or a large conference room. They can controlled through wireless dimming systems, DMX controllers, and wall switches. Lighting Source: Surface mounted LED chips in a variety of configurations of LED chip sizes and numbers. Read: What’s the difference between a 5050 LED, 3014 or a 3528 LED strip? They can come in either 120/220vAC input or 12/24vDC input. They can also come in a wide variety of single colors and color changing options. Size: Very small and compact. Strip lights are normally no wider than ⅜’’ wide and 1/16’’ tall. Can be hidden where no other lighting type can. Brightness: Low brightness to very high brightness. Strip lights can produce an extremely high amount of light. Each project will require a different amount of light output. Don’t worry, we’re experts and we will help you navigate to the best product for your project. We carry some of the brightest strip lights available and all of the LED strip lights can be controlled and dimmed. Applications: They are used as accent lighting, general illumination task lighting, display lighting, backlighting and even inside and even space vehicles to grow plants. - Other options for use is TV backlighting, under kickboards, display / jewelry cases, bar and club lighting, architectural designs, terrariums / indoor garden lighting, above cabinet lighting, under counter lighting, refrigerator lighting or cove lighting. Search by application. 1. Brightness: Very high brightness options available and are able to be dimmed. 2. Size: Strip lights are very easy to install in a variety of environments. These lights are also called ‘tape lights’ because of their similarity to tape. 3. Mounting: Easy to mount and comes with a 3M adhesive on the back to make installation easy. 4. High bend angle: Ability to bend 90 degrees. 5. Light quality: Varies from company to company, but typically you see a lot better CRI, light purity, color consistency, and color accuracy with LED strip lights. 6. Colors and options: They offer a wider range of color-changing options with a more complete circuit system for controlling colors, via a remote or a more complex DMX system. 1. Run Length: Strip lights typically come in 12 or 24v DC inputs. The DC versions of the strip lights have a maximum run length before Voltage Drop occurs. 2. 360 degree viewing angle: The majority of the strip lights only have a 120 degree beam angle, making a 360 degree light installation more difficult. 3. Horizontal bend angle: Like a piece of thick tape, it can be bent vertically but not horizontally, making some installations difficult. Strip light connectors do solve this problem, however. 4. Installation Complexity: Most strip lighting kits are very self explanatory and able to be installed by a novice. For some projects that require hard-wiring to a wall dimmer, calculating wattage usage, or wiring in walls, an electrician will be needed to complete the installation. The cost of LED strips lights and rope lighting can vary greatly, but the price does tend to match the quality too. If you plan on using your lights every day and having them for years to come it’s always worth investing a little extra in quality lighting. While both rope lights and LED strips are great and versatile lighting options, we find that when it comes to a brighter light, customizing lengths, angles and colors LED strips provide our customers with much more leeway to materialize the vision of their projects. If you’d like to speak to us about your lighting ideas or have any further questions just drop us an email at info@flexfireleds.com or give us a call at 1-844-FLEXFIRE and we’ll be there to help you every step of the way!